We hit the surf clam motherlode on our last foraging trip. There's a particular place in one of the streams flowing back down to the sea which must have just the right combination of temperature, nutrients, sand and wee stones to provide them with an ideal home (surf clam style). They were still small but we have learned from experience how tasty they can be in a chowder. My brother found an enormous shell from a recently-deceased native oyster Ostrea edulis. I'd never seen a true oyster shell that size; it must have been fully 16 centimetres across. 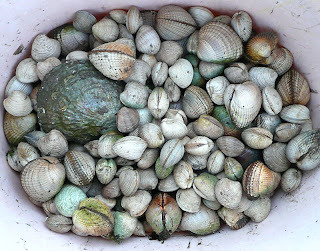 We also found a decent number of cockles and my mother insisted on collecting a load of wilks, common whelks, limpets and slightly gritty mussels. We banned those from the ensuing chowder. She also accepted a gift of a large bag of razorfish from a passing salt-wielding forager. It took us about an hour and a half to clean and prep all the shellfish. We scrubbed them all and removed the beards from the mussels, then I cut open the razorfish and extracted the tastiest bits. My brother made a base for the chowder which included stock made from prawn shells, cream, herbs and potatoes. He then added the surf clams and cockles to cook until the shells opened. Meanwhile I boiled up the mussels, limpets, wilks and whelks in a separate pot. A dusting of flaked chipotle, garlic salt and chili-sauce provided the appropriate flavourings for the razorfish, which I then attempted to flash fry. I must now admit to having a condition known as frying-pan-not-hot-enough-because-my-mother's-stove-is-rubbish rage. I'm seeking treatment but it's quite specialised. The razorfish ended up rather rubbery as a result of half-boiling in the pan rather than truly frying. They were better raw as my brother conceded until I pointed out to him that the pieces were still moving at the time he tried one. We already had enough shellfish to feed a rugby team and make 70s-style shell-covered table lamps for all their extended families, when my mother announced that this lot was just our starter and that we were also having main course and dessert. The chowder was rich, flavoursome and wonderfully messy to eat. I also managed a few mussels, a couple of bulots (whelk) and even a vulcanised limpet. Another excellent family meal scavenged from Gastrobeach for free (apart from the smoked ham joint and chocolate ice cream).